Indie Retro News: Fox n Forests - A nostalgic trip back to the 16bit platforming era, coming Spring 2018! Fox n Forests - A nostalgic trip back to the 16bit platforming era, coming Spring 2018! If you remember growing up playing 16bit platformers, either on the SNES or Sega Megadrive such as Mickey Mouse or even Ghouls 'n Ghosts, then have we got the game for you! 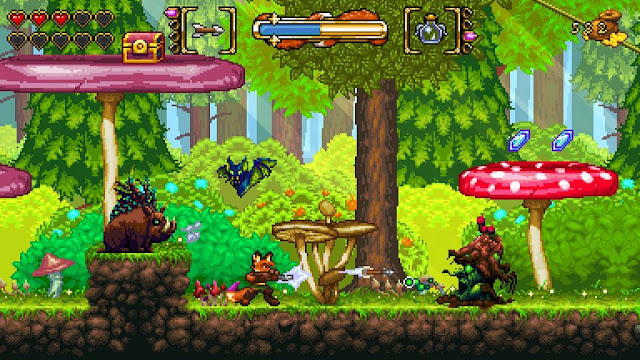 This is 'Fox n Forests' developed by Bonus Level Entertainment, a gorgeous looking 16-bit inspired pixelated platformer, where you play as a Furry that can loot, upgrade, hack and slash and even change the very seasons of the game you're playing in! Yes that's right, this game lets you switch seasons to avoid obstacles or even beat enemies! What a lovely game indeed and not only does it have a teaser trailer but it's coming to PC, Linux, Mac (Steam and DRM free) Spring 2018.